I'm still working on the gift card giveaway (since I have to tally up more than 1 entry per person and type each name by hand it's taking longer). 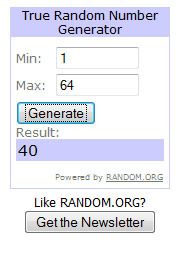 For now though since I could just random.org this and pick out the comment in order I am putting up the winner of my Facebook Giveaway from March. I had a total of 64 comments including my own (of course I would have re-rolled if I got a 1 lol). I have e-mailed you, please respond within 48hrs or I will have to choose another winner. Since I have the day off finally, I'm going to try and work on the the reviews I need post as well as possibly a makeup tutorial if my eyes aren't too irritated from getting used to contacts.